Driving the fabulous 300SLR Mercedes, 25 year old Stirling Moss scored one of his greatest victories in the gruelling Mille Miglia of 1955. Partnered by Denis Jenkinson, whose pace notes helped to guide him round the treacherous 1000 mile course, Moss took the lead at Rome. He then proceeded to confound the tradition that 'he who leads at Rome never wins' by racing on to a famous victory, the first ever by a Briton and in the fastest time ever recorded of 10 hours 7 minutes and 48 seconds, an average speed of 97.9mph. Michael Turner's painting shows the 300 SLR thundering down the Raticosa Pass during the later stages of the race, to the delight of crowds of enthusiastic spectators. The print edition corresponds to the number carried by Moss's car to denote his start time from Brescia. 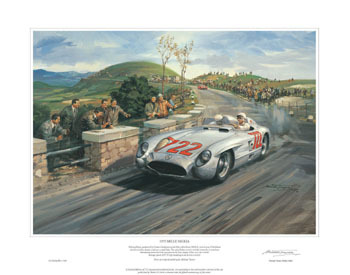 Each print is individually signed and numbered by the artist and countersigned by Sir Stirling Moss O.B.E.